This season at least 32 teams in each bracket will compete for CIAC basketball titles. Tyler Sizemore – CT Post. 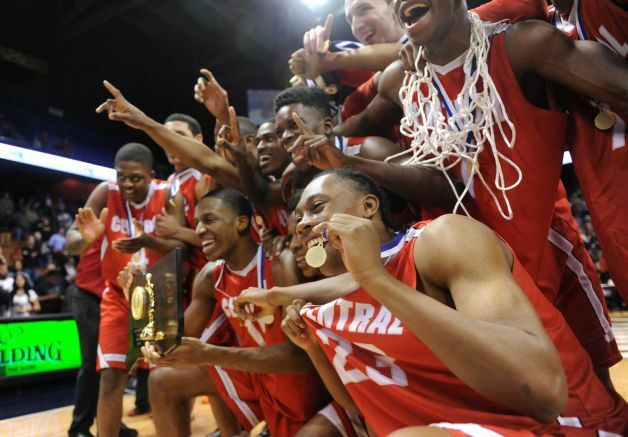 At its September meeting, the CIAC Board of Control approved a joint proposal from the Boys and Girls basketball, and Baseball Committees to allow teams with a winning percentage of less than 40-percent to qualify for CIAC Tournaments in order to fill the brackets to 32 teams if fewer than 32 teams reach the 40-percent threshold. The Board approved the proposal for a two-year trial, beginning with the 2015-16 basketball season this coming winter and the 2016 baseball tournament this spring, and the policy will be reevaluated after the two-year period. It will rive more schools a chance to compete in the tournament. Over the previous five seasons an additional 35 teams in boys basketball, 61 in girls basketball, and 31 in baseball would have qualified for postseason play. Increased tournament opportunity increases interest and determination for teams to compete for the entire season in hopes of qualifying for the tournament. All games become important. No additional play dates are needed to implement the trial. Adoption will eliminate byes in the tournaments, which levels the field for all qualifying teams as all teams will now play the same number of games. This is particularly relevant for baseball with its pitching rule. This change will have no impact on tournament fields in which more than 32 teams qualify. Boys and girls basketball will use the same power point structure to break ties and fill brackets. Any questions on these changes can be directed to Paul Hoey at phoey casciac org. Qualifying for CIAC Tournaments at less than 40-percent win record has been approved for these three sports, and had previously been approved for boys ice hockey, but other sports committees have will have the discretion to consider filling the brackets in the future. All proposals from sports committees will require approval from the Board of Control.